In the early days of sand quarrying, the back-breaking task of digging out and removing the top soil, or overburden, and the excavation of the sand was carried out entirely by hand by poorly paid workmen known as dobbers. The overburden, or the top soil, was removed using a procedure called ‘untopping’. By standing on the top of the ledge sand was scoped down (locally know as dobbing). Big chunks of sand fell to the bottom of the quarry where the wagons were; there it was easy to be shovelled away. Another method was to dig 20 foot horizontal channels by hand in the sand, just underneath the clay. The working face was supported by columns of sand which were left intact. When everything was prepared, the pillars were chopped away, causing huge amounts of the clay to come crashing down, as the workmen ran to avoid being caught in the collapse. 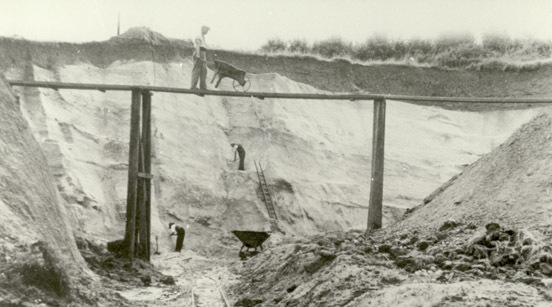 Wooden trestle bridges were often built across the quarry and used as barrow runs to make removal of the clay easier. On other occasions a ledge might be dug beside the clay on top of the exposed sand and tracks laid down. When loaded with clay the skips were pushed, or pulled by a horse, and the overburden disposed of in another part of the quarry. 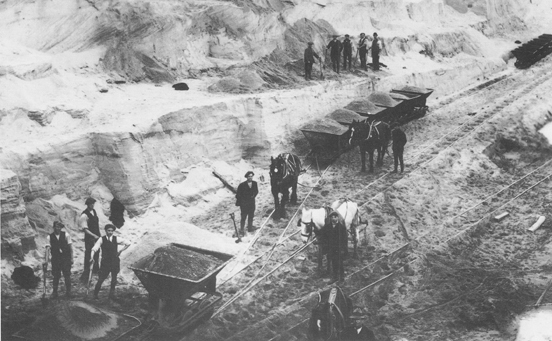 Horses were used in the heavy work in the early days of the sand quarries. Boys too young to become dobbers were employed as horse boys, tending to the horses before leading them to the quarry in time for the dobbers to start filling their skips with sand. The horse, led by one of the boys, would then haul one skip at a time from the quarry face, out of the pit and to the sidings at the end of the Leighton Buzzard Light Railway. 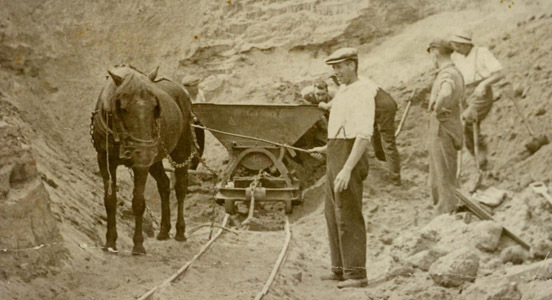 Horse boys often became dobbers when they were old enough to begin the dangerous job of cutting sand by hand and filling the skips at the quarry face. The dobbers would climb ladders up the side of the sand cliffs and once at the top would gouge out a tiny ledge, just wide enough to stand on, and begin to scoop the sand over the edge, ready to be shovelled into wagons waiting below. Often sand gave way beneath the feet of the dobbers and they would slip over the edge of the sand cliff, hopefully landing on the soft sand below! Sometimes the dobbers took a dangerous shortcut to the digging process by undermining the sand to cause a collapse. The men would cut horizontal grooves in the base of the sand causing the whole face to slide down. When the sand started to slide, the men turned to face the oncoming sand and then dived to lay flat on top of it as it came towards them. Inevitably, some men were buried or crushed during these sand collapses. The risk must have seemed worth it to the low paid dobbers who were paid according to how many skips they filled in a day, generally up to about 30. They were also paid according to the type of sand excavated: more money could be earned for the more valuable sand. Manual methods of sand excavation continued even after mechanical methods were available because it was an easy way for sand to be dug. During the 1930s the first mechanical excavators appeared, but hand-loading of the quarried material carried on in the Arnold quarries until the mid-1960s. Italian prisoners of war were used to dig sand in the Garside quarries and helped extend manual labour in these pits until 1945.